Home » Expert Feature » Is Your Joint Pain Coming from Arthritis? Joint pain is a common problem. Often it is transient and resolves on its own. However, when it persists, x-rays or more advanced imaging can help make a correct diagnosis. Arthritis can be one cause of persistent joint pain or pain in multiple joints. X-rays are often a good tool for determining if arthritis exists and, specifically, what type. Common types of arthritis include rheumatoid arthritis, psoriatic arthritis, and osteoarthritis. Several less common types of arthritis also occur with regular frequency. It is important to make the correct diagnosis since the treatment varies per arthritis condition. When multiple joints are involved, a survey of the joints is often helpful to confirm the diagnosis and to establish a baseline by which future studies can be compared. This serves as a means of determining how responsive a patient is to the recommended treatment. 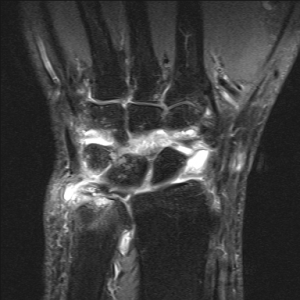 Bright white areas represent inflammation in this wrist MRI. In the past, treatment options for arthritis have been limited. Today, newer effective “biologic” medications are now widely available. As with any medication, there are potential adverse reactions and the cost of prescribed drugs can also be prohibitive. The potential adverse side effects of these medications can also be diminished by adjusting the dose. An MRI can help determine a proper dosing amount. For these reasons, it is vitally important to secure a correct diagnosis. At Wake Radiology, we take all of this into account. We do our very best to capture the needed image the first time and your joint images are interpreted by trained specialists in orthopedic and sports imaging. An x-ray is not the only type of medical imaging that can assist with diagnosing arthritis. In fact, other tools – like MRI and CT – can be more effective. Inflammation of the tendon and tendon sheaths. The additional cost of the MRI, over an x-ray, can be justified in that a correct diagnosis will get the patient started on the appropriate treatment plan sooner. Also, follow-up MR imaging can quickly and accurately determine if the treatment is having its desired effect, potentially saving thousands of dollars and months of treatment with expensive drugs. MRI is also useful to characterize the extent of the arthritis and potential need for steroid injections for pain or joint replacements. If a replacement is needed, MRI is sometimes used to customize the type of hardware needed. Finally, MRI is used extensively to exclude other causes of pain apart from arthritis including tendonitis and tendon tears, ligament injuries, muscle strains, bursitis, tumors, or even subtle fractures – all of which are not detectable on x-rays. A CT scan can be a useful imaging tool when MRI is not possible. For example, a CT is a good option if the patient has an incompatible pacemaker or is not physically able to get into the machine. A nuclear medicine bone scan is also a very sensitive test for determining if the patient’s cause of pain is bone-related and possibly due to arthritis, but is not recommended in making specific diagnoses. If you are suffering from joint pain or arthritis, talk with your doctor to determine if you are someone who may benefit from a steroid injection for pain relief. Selectively injected joints can dramatically decrease pain for months. Some joint injections benefit from being conducted under fluoroscopic, CT or ultrasound guidance as this helps ensure the accurate delivery of medicine to the joint. 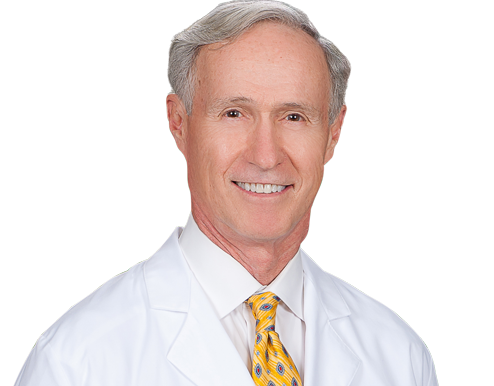 At Wake Radiology, we routinely inject hip, shoulder and knee joints as well as the small joints of the feet and ankles, but any joint can be accessed. While not a cure for damaged joints, steroid injections will, in most cases, relieve pain due to inflammation. We encourage you to talk with your doctor about how medical imaging could assist in how you treat your joint pain or arthritis.